I do a TON of printables for my website. 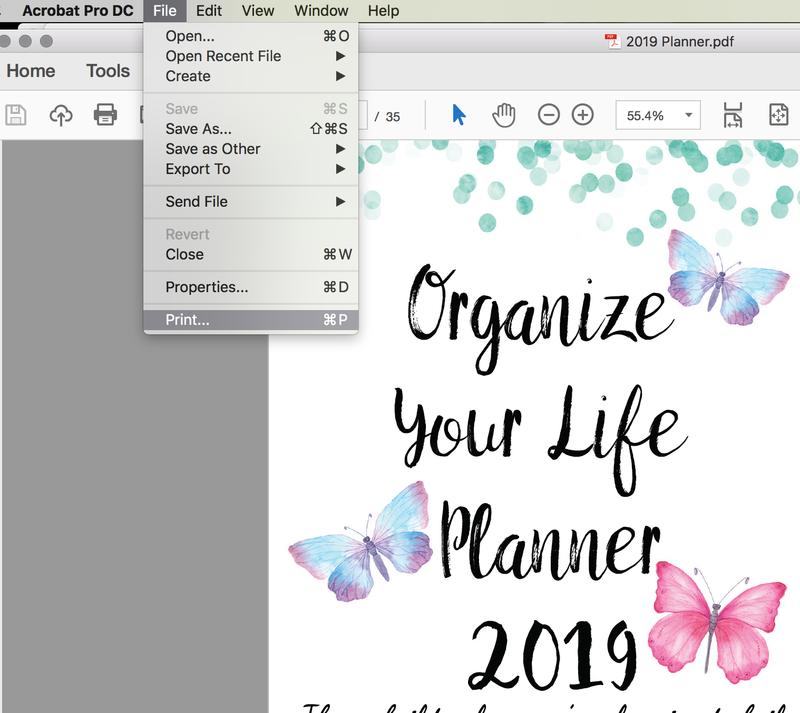 I get quite a few reader questions, and one that keeps popping up is “how do I resize this printable to fit my planner?”. So I dug out my calculator, did some research, and have the answer for you. For both methods, you use free Adobe Acrobat reader to read the pdf file. The screenshots below use Adobe Acrobat. 2) Use regular paper, enter custom size, and cut off excess paper. 3) Use regular paper, enter percentage, and cut off excess paper. If your planner is one of these, lucky you! Adobe is going to do all the work of re-adjusting. All you need is to buy the appropriate size paper and use Method #1 below. If your planner is NOT one of those, don’t worry. 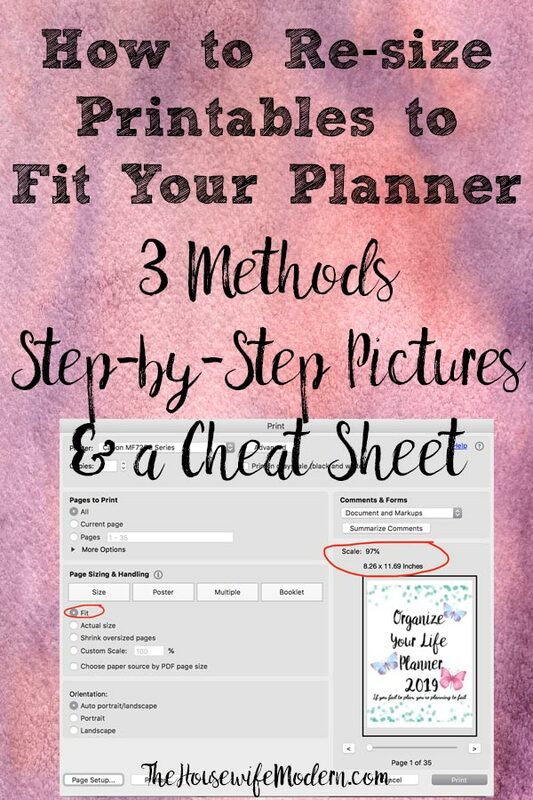 You’re going to scroll down to Methods 2 & 3 below and I’ll show you how to resize printables to fit your planner. You can use whichever method works better for you. 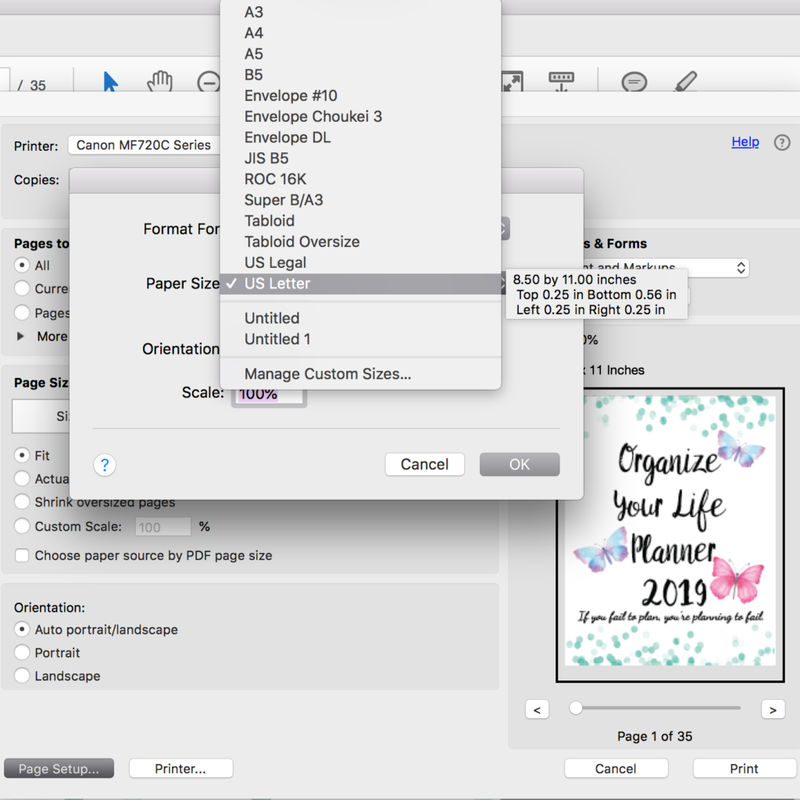 Your first option when you want to resize printables is to use non-standard paper, such as A4 or A5. To use this method, you need to use a pdf file. 1. Go to ‘print’ like normal. 2. Click on ‘page setup’ (it should be in the lower left-hand corner). 3. 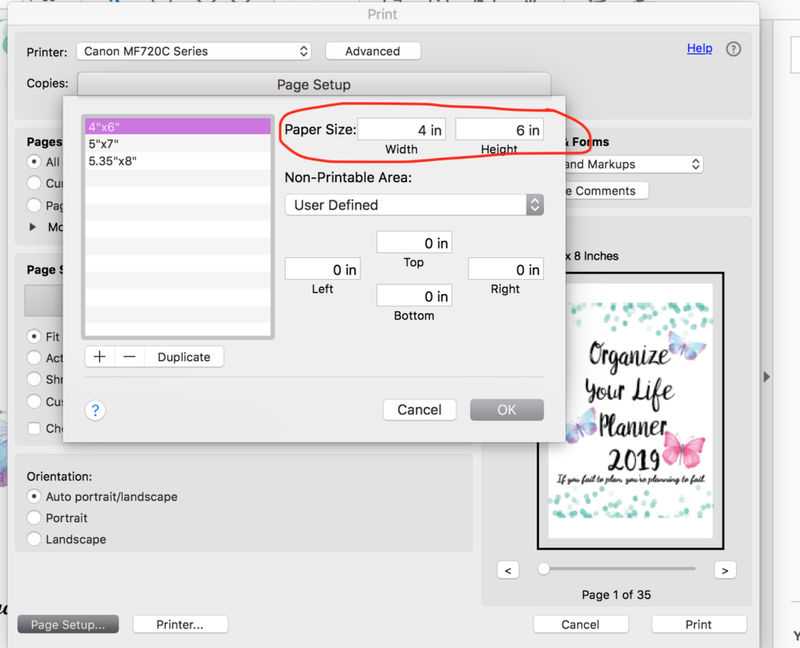 In the ‘page setup’ box, where it says ‘paper size’, click. A list of options will appear. Select the appropriate size. 4. Click ‘okay’ in the ‘page setup’ box. 5. Make sure under ‘Page Sizing & Handling’ that the “Fit” option is selected. 6. Load your printer with the correct size paper. Go to "File" and "Print" like normal. Click on 'Page Setup' (circled in red in the image). In the 'page setup' box, select 'paper size.' When you click there, you can choose other paper sizes. Select your size. Hit "OK". Under "Page Sizing & Handling", make sure "Fit" is selected (circled in red). 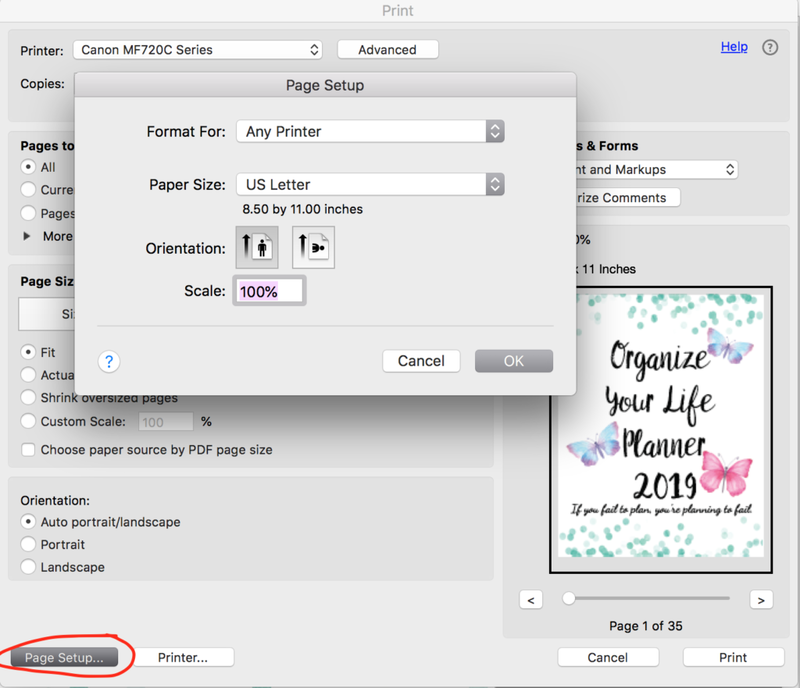 You will see in the preview box that it now has the scale and your new paper size listed. Your second option- and the one I prefer, as it gives you more flexibility- is to use regular paper. In this method, you’re going to have Adobe Acrobat re-size your image, print on regular paper, and cut off the excess. 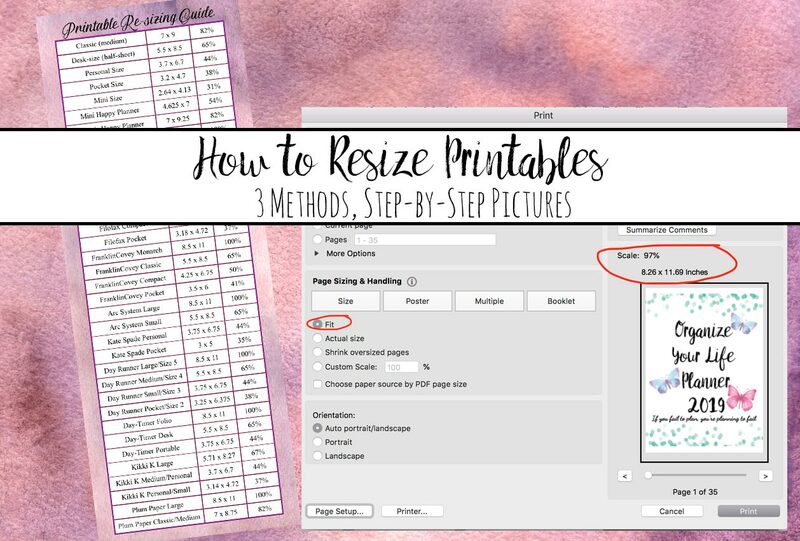 This is the easiest way to resize printables to fit a wide variety of planners. 3. In the ‘page setup’ box, where it says ‘paper size’, click. A list of options will appear. Select “Manage Custom Sizes”. 4. A custom sizes box will appear. 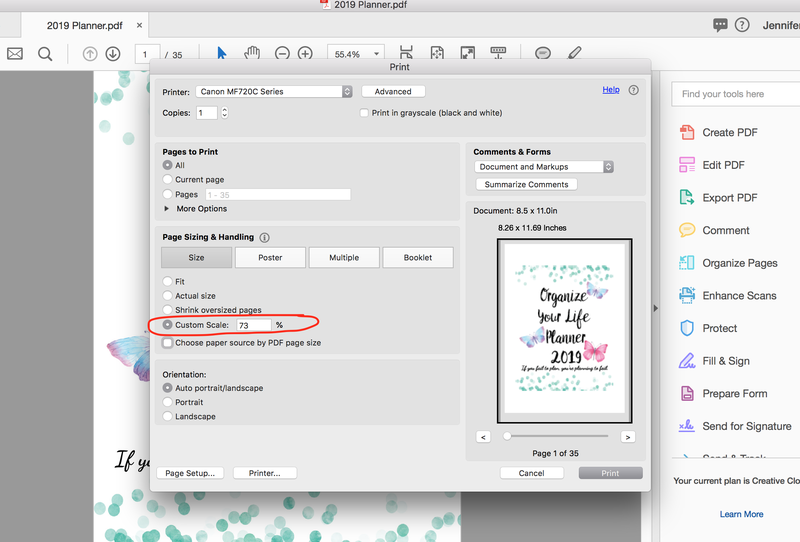 Enter your planner page size. Make sure ‘non-printable areas’ are all set to zero. Click okay to save. Click okay again to save “Page Setup” changes. 6. Load your printer with regular paper. 8. Trim off the excess from the printed page. Under "Page Setup", select "Manage Custom Size". Then input your planner size. You can also add margin. Select okay. Then select "fit" under "Page Sizing & Handling". Print. Your third option is to use regular paper. In this method, you tell the printer to print a certain “percentage” of the original size, print on regular paper, and cut off the excess. 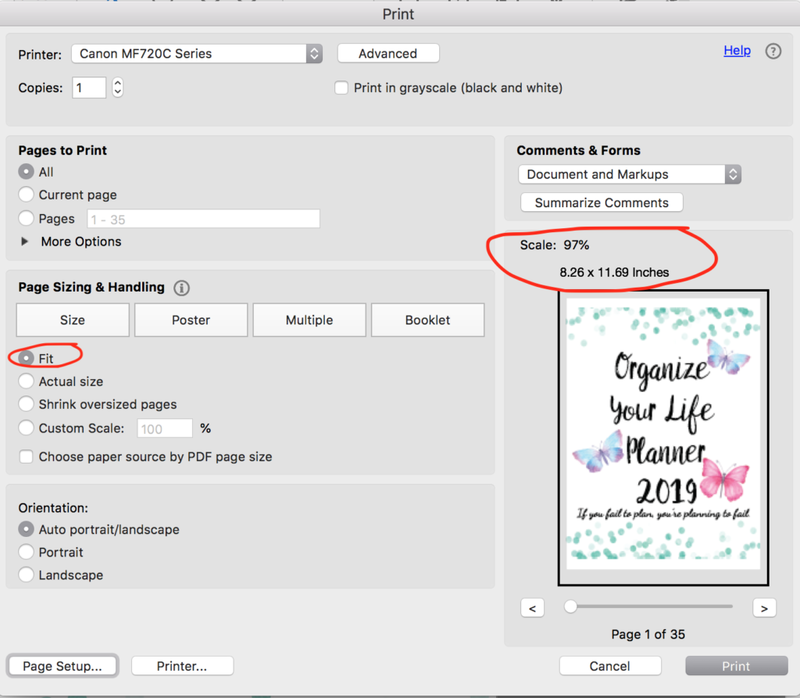 This is the easiest way to resize printables to fit a wide variety of planners and in a variety of programs. For example, you can use Word or other programs and print at certain percentages. 3. Under “Page Sizing & Handling,” click on “custom size”. 4. Enter your percentage into the box. 6. Trim excess paper off the edges of your printed sheet. Under "Page Sizing & Handling," click on "Custom Size." Then enter the percentage you want to print at. You can see in the preview that the image is resized and centered on the page. What percentage do I print at? I went ahead and did the calculations for some popular planners below. But if your planner size isn’t on here, here is how you figure it out. Take the width of your planner page. Divide it by 8.5. Then multiply that by 100. The answer is your percentage. 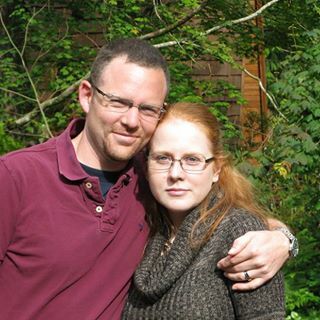 For example, say your planner page is 5″ wide and 8″ tall. 5 divided by 8.5= .588. Times 100= 58.8. So we’ll print at 59% (slight rounding is fine).